Of all excess heat resulting from people's emissions, 93.4% goes into oceans. 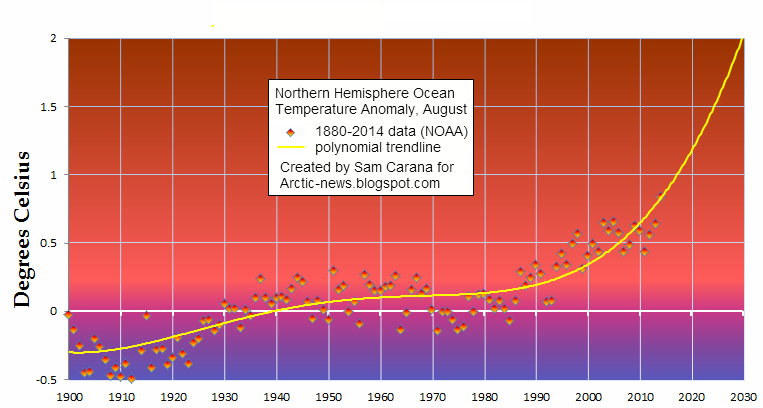 Accordingly, the temperature of oceans has risen substantially. 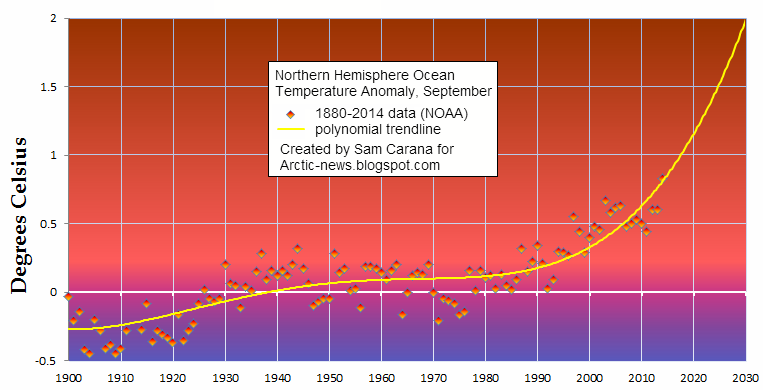 The anomaly was 0.84 °C in August 2014, as illustrated by the image below. On specific days, anomalies were much higher. 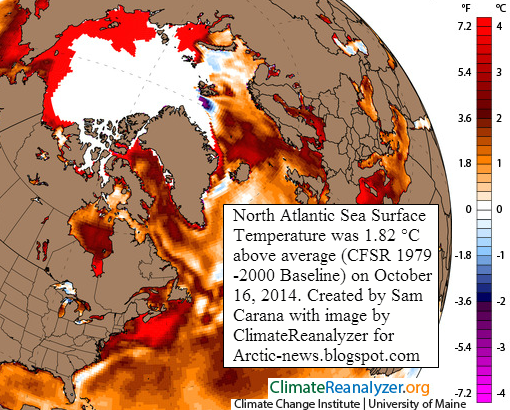 On August 19, 2014, the Northern Hemisphere showed a sea surface temperature anomaly of 1.78 °C, while the North Atlantic sea surface temperature was 1.82 °C above average (CFSR 1979-2000 Baseline) on October 16, 2014, as illustrated by the image below. Sea surface temperature anomalies are at the top end of the scale in many places in the Arctic, as well as off the coast of North America. The danger is that the Gulf Stream will keep carrying ever warmer water from the North Atlantic into the Arctic Ocean, threatening to unleash huge methane eruptions from the Arctic Ocean's seafloor, in turn causing even higher temperatures and more extreme weather events, wildfires, etc. Above image shows methane levels as high as 2666 ppb, as measured by the MetOp-2 Satellite at 14,385 ft (~4.4 km) altitude on October 26, 2014 am. Is 2666 ppb as high as it will get? Sadly, methane releases from the seafloor of the Arctic Ocean are becoming increasingly larger around this time of year and they look set to get even larger than this. 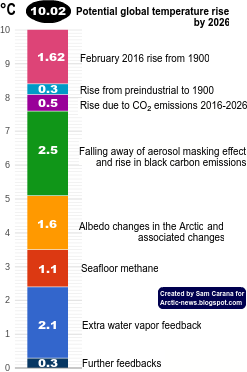 Note that the amount of methane actually erupting from the seafloor of the Arctic Ocean is even larger than what is visible on above image, for the following three reasons. No data were available for some areas, as the IASI (Infrared Atmospheric Sounding Interferometer) instrument measuring methane only covers a certain width. 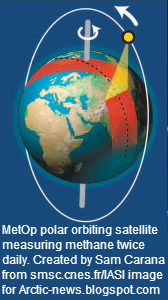 The white shapes showing up on above images are areas where no measurements were taken, resulting from the way the polar-orbiting satellite circum-navigates the globe, as pictured on the image on the right. Furthermore, quality control failed in the grey areas on above images, indicating reading difficulties due to high moisture levels (i.e. snow, rain or water vapor), as also discussed in an earlier post. Accordingly, high methane levels (above 1950 ppb) as show up in the yellow areas could also be present in the many grey areas over the Arctic Ocean. When also looking at methane levels on days following the high 2666 ppb reading, methane is persistently present over most of the Arctic Ocean, as illustrated by the above October 29, 2014, combination image, confirming that high methane levels were likely present in areas where no data were available on October 6, 2014. Much of the methane that is released from the Arctic Ocean's seafloor is broken down by microbes as it rises up in the water. The SWERUS-3 research team recently found methane in the waters of the East Siberian Sea at levels that equate to atmospheric levels of 3188 ppb. 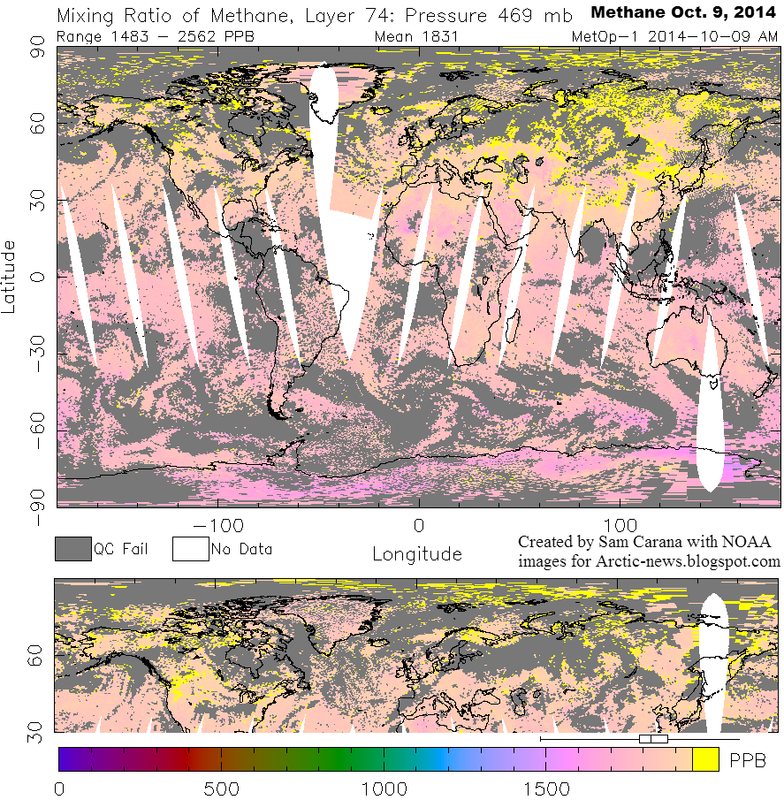 Much methane is broken down in the atmosphere by hydroxyl, as illustrated by the image below, showing carbon dioxde levels on October 27, 2014, that indicate that large amounts of methane are broken down at higher latitudes on the Northern Hemisphere. 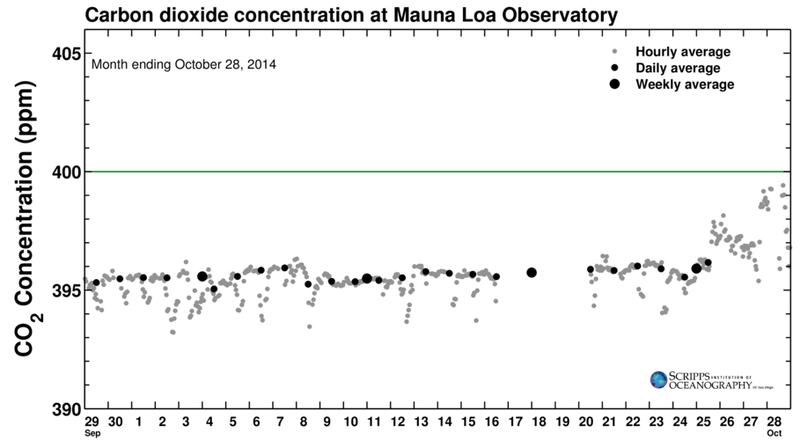 The latter point could explain the sudden recent rise in carbon dioxide levels, as also detected at Mauna Loa, Hawaii, as illustrated by the image below. In conclusion, the amount of methane that is erupting from the seafloor of the Arctic Ocean is larger than what is visible on satellite images, and the water will be highly saturated with methane at locations where the methane is escaping from the seafloor, highlighting the danger that, in case of large abrupt releases from the Arctic Ocean's seafloor, microbes and hydroxyl will quickly get depleted locally, resulting in little of the methane being broken down, as discussed at an earlier post. Why are such huge amounts of methane starting to get released from the Arctic Ocean's seafloor now? As the image below shows, temperature at 2 meters was below 0°C (32°F, i.e. 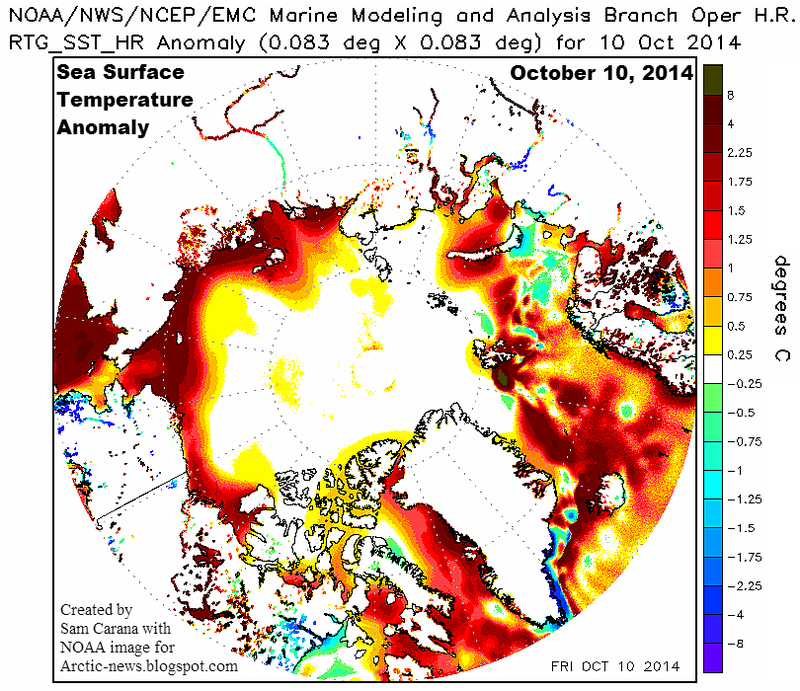 the temperature at which water freezes) over most of the Arctic Ocean on October 26, 2014. 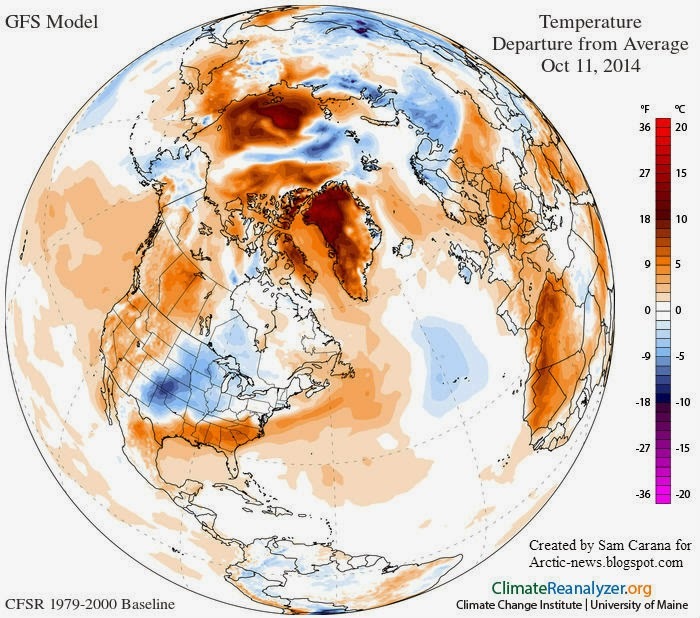 The Arctic was over 6°F (3.34°C) warmer than average, and at places was up to 20°C (36°F) warmer than average. Above image illustrates the enormous amount of heat that has until now been transferred from the waters of the Arctic Ocean to the atmosphere. 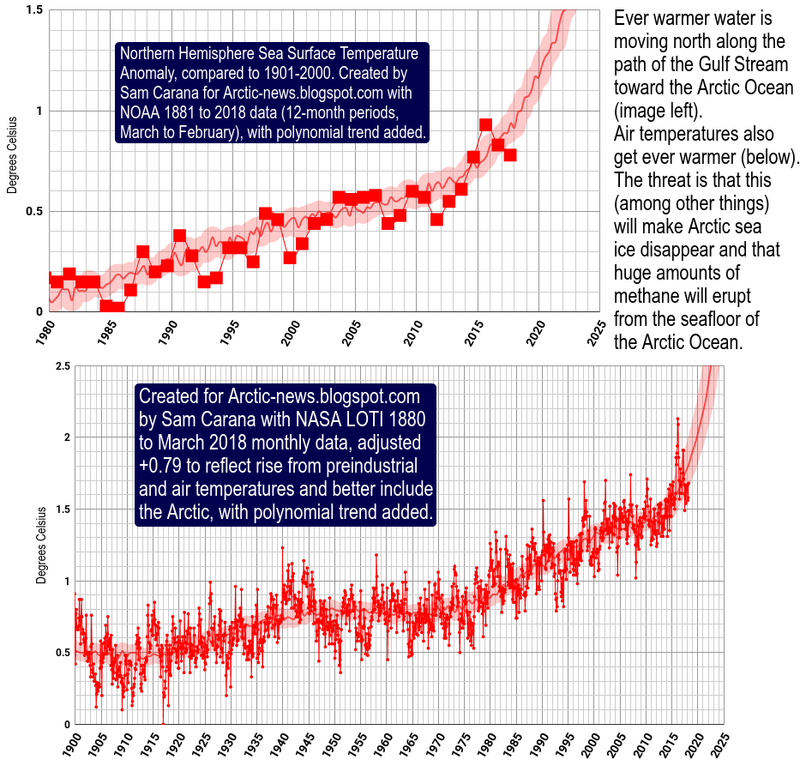 Underneath the surface, water temperatures are much higher than they used to be and, as around this time of year the Arctic Ocean freezes over, less heat will from now on be able to escape to the atmosphere. Sealed off from the atmosphere by sea ice, greater mixing of heat in the water will occur down to the seafloor of the Arctic Ocean. As land around the Arctic Ocean freezes over, less fresh water will flow from rivers into the Arctic Ocean. As a result, the salt content of the Arctic Ocean increases, making it easier for ice in cracks and passages in sediments at the seafloor of the Arctic Ocean to melt, allowing methane contained in the sediment to escape. 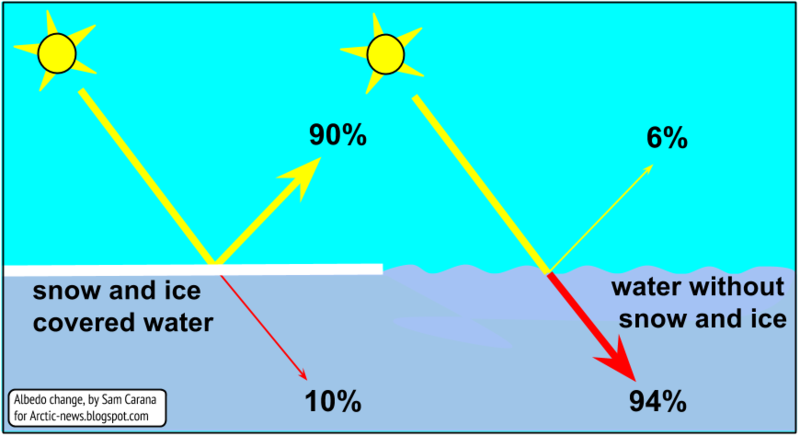 Furthermore, the sea ice makes that less moisture evaporates from the water, which together with the change of seasons results in lower hydroxyl levels at the higher latitudes of the Northern Hemisphere, in turn resulting in less methane being broken down in the atmosphere over the Arctic. This situation will continue for months to come. Salty and warm water (i.e. warmer than water that is present in the Arctic Ocean) will continue to be carried by the Gulf Stream into the Arctic Ocean, while less heat and moisture will be able to be transferred to the atmosphere. In conclusion, high methane levels threaten to further accelerate warming in the Arctic, in a vicious cycle escalating into runaway warming and resulting in death, destruction and extinction at massive scale. So, what can be done to reduce the risk? It is imperative that large emissions cuts are made quickly. The Climate Plan calls for 80% emission cuts by 2020, as one of multiple lines of action that need to be implemented in parallel. The IPCC points at the need for carbon dioxide removal and also warns about ocean warming continuing for centuries (text below). Indeed, even if all emissions by people could somehow be brought to an abrupt end, this alone will not stop the rise of ocean temperatures, at least not for a long time. For starters, air temperatures would start rising within days, in response to the disappearance of aerosols that now mask the full wrath of global warming. Furthermore, such a temperature rise would further accelerate feedbacks such as snow and ice decline, methane hydrate destabilization, etc., in turn feeding further temperature rises. The Climate Plan therefore calls for carbon dioxide removal, as well as for active removal of other greenhouse gases from the atmosphere, and for further lines of action. Again, merely implementing the above lines of action will not suffice to quickly bring down ocean temperatures. Paleo-climate records show that falls in temperature go hand in hand with falls of carbon dioxide in the atmosphere to levels under 280 ppm, as opposed to current carbon dioxide levels that are around 400 ppm. 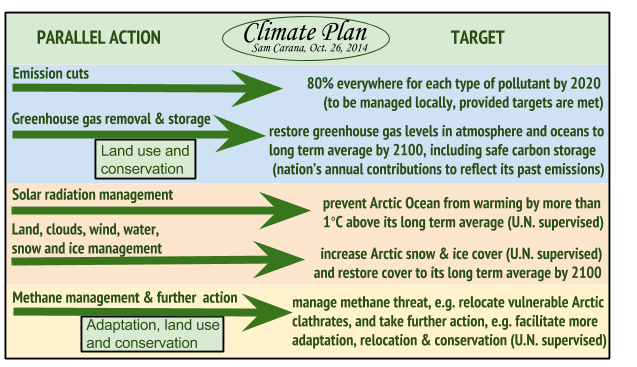 The Climate Plan calls for comprehensive and effective action that includes additional lines of action. Such additional action will require U.N. supervision, which may make it hard for the necessary action to obtain sufficient funding. In earlier posts, it was suggested that, besides having fees imposed on facilities that burn fossil fuel and on sales of fossil fuel itself, additional fees could be imposed on commercial international flights. As long as it seems too hard to substantially reduce emissions associated with such flights, it seems appropriate to explore further ways to minimize such flights, e.g. by imposing additional fees that could help fund further action. There are a number of ways such fees could be implemented. Such fees could be calculated based on the distance traveled or as a percentage of the fare. Fees could also be calculated on the basis of the traveler's flying history, e.g. in the form of frequent flyer fees. 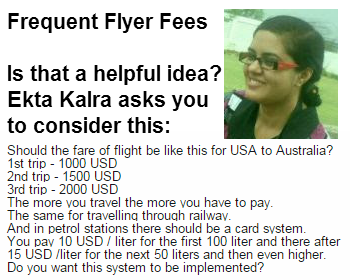 Such fees could be collected either by the respective airline or airport. In the box on the right, Ekta Kalra gives further details about how the latter idea could be implemented. 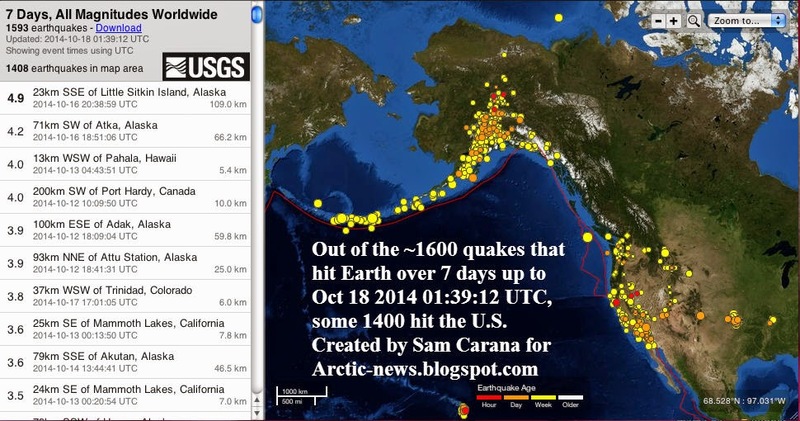 U.S. hit by numerous earthquakes? During the past decade from December 2004 to present, no less than 18 great (Mw ≥ 8.0) earthquakes occurred globally (~1.8 per year), compared to 71 from 1900 to mid-2004 (~0.68 per year), yielding an effective rate increase of 265%, says seismologist Thorne Lay of the University of California at Santa Cruz. What about smaller earthquakes? 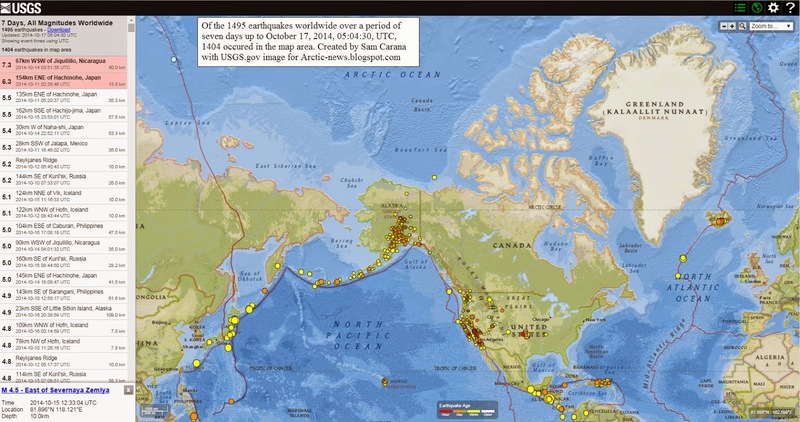 As the image below illustrates, of the 1495 earthquakes that hit the world over a period of seven days up to October 17, 2014, 05:04:30, UTC, 1404 occured in the map area of the image below. However, the U.S. is over-represented, the USGS map doesn't show smaller earthquakes (under magnitude 4) outside the U.S.
Can we expect more earthquakes to hit the U.S.? If so, why? First of all, as said, many earthquakes do appear to hit the U.S. when looking at above image, but the above USGS map doesn't show smaller earthquakes (under magnitude 4) outside the U.S. Nonetheless, there can be other reasons why so many earthquakes have recently hit the U.S., so let's explore some of them further. It's a well-known phenemenon that, during the northern summer, more earthquakes do hit the Northern Hemisphere, rather than the Southern hemisphere. That's a natural phenomenon, but there can also be ways in which people can contribute to the incidence of earthquakes. Isostatic rebound and changing stress conditions due to meltwater run-off can trigger seismic events. 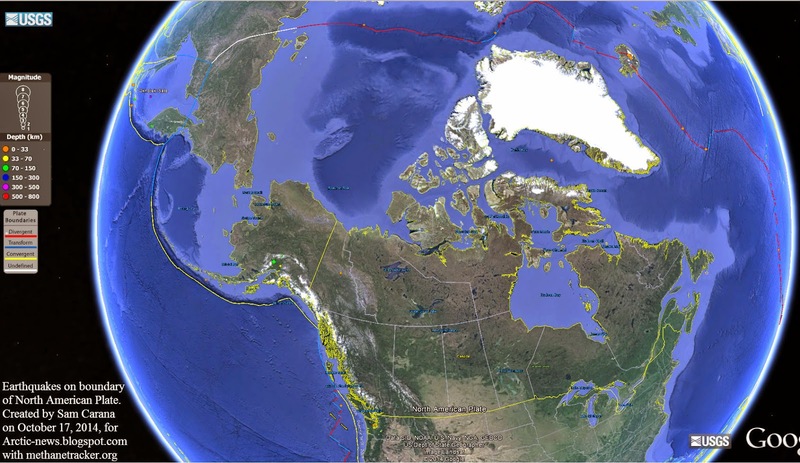 For months now, a huge amount of seismic activity has hit faultlines along the boundaries of the North American Plate, as earlier discussed in the earlier post Ring of Ice. “There may be a threat of submarine landslides around the margins of Greenland, which are less well explored. Greenland is already uplifting, reducing the pressure on the crust beneath and also on submarine methane hydrates in the sediment around its margins, and increased seismic activity may be apparent within decades as active faults beneath the ice sheet are unloaded. This could provide the potential for the earthquake or methane hydrate destabilisation of submarine sediment, leading to the formation of submarine slides and, perhaps, tsunamis in the North Atlantic. We see evidence of the Earth ‘waking up’ specifically in relation to seismic activity in areas of Alaska where dramatic ice loss (up to 1km vertical thickness) has occurred over the last 100 years, and also in relation to the correlation in many high mountains terrains of increased landslide occurrence and heatwaves. Particularly dangerous in this respect are earthquakes along the fault that crosses the Arctic Ocean, such as the 4.5 M earthquake indicated by the blue dot on the top map, also indicated on the map below. The danger here is that such earthquakes could destabilize methane hydrates that are highly prominent in sediments under the Arctic Ocean. As discussed in earlier posts, wild weather swings could also contribute to destabilization of methane hydrates. Furthermore, a study published this year suggests that human-caused groundwater depletion contributed to the prominence of earthquakes in California. Similar suggestions were made in a study focusing on a 2011 earthquake in Spain. Besides the above wild weather swings, wild weather itself could similarly be destructive. As hurricane Sandy approached the U.S. coast in 2012, the force of waves slamming into other waves shook the seafloor, which was recorded by earthquake sensors. The energy generated by Sandy was similar to small earthquakes between magnitudes 2 and 3, seismologists at the University of Utah estimated. Did typhoon VongFong cause earthquakes around Japan? 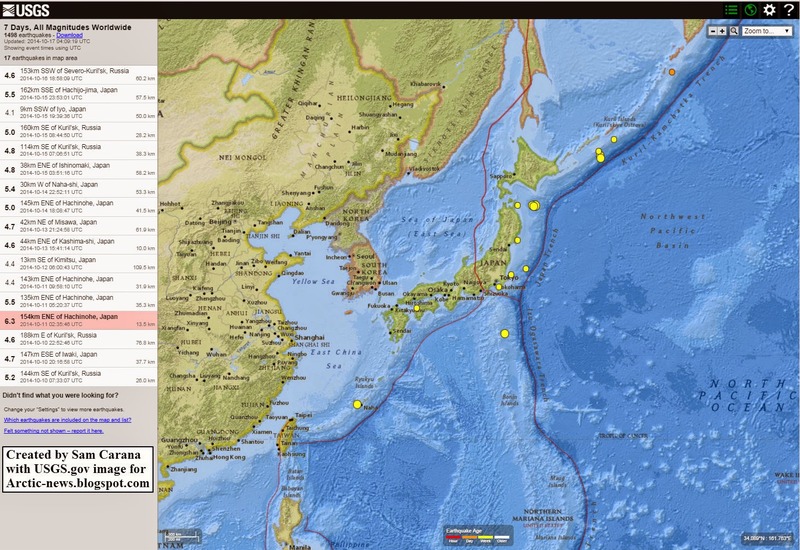 The image on the right shows earthquakes that occured around Japan during the seven days up to October 16, 2014. Again, the map doesn't show the smaller quakes, so further studies may be needed to shed more light on this. 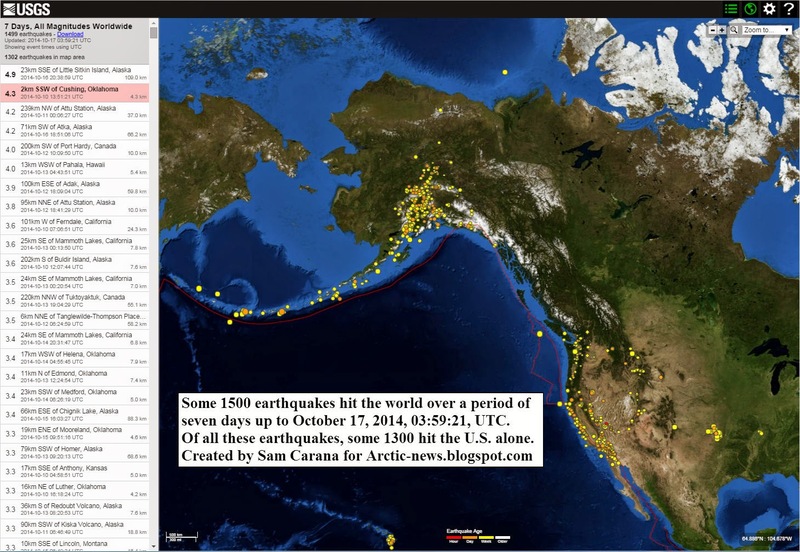 As above image shows, some 1500 earthquakes hit the world over a period of seven days up to October 17, 2014, 03:59:21, UTC. Of all these earthquakes, some 1300 hit the U.S. alone. This points at a further cause, i.e. fracking. A recent study has confirmed that fracking is linked to more earthquakes than previously believed. Meanwhile, the EPA is still underreporting methane's Global Warming Potential, as earlier discussed at Myth #7 and despite a call by Rob Howarth and other methane experts to accurately account for warming effects of methane. Below is an updated map with more recent data, showing that over a period of 7 days up to October 18, 2014, 01:39:12 UTC, some 1400 earthquakes hit the U.S. Again, note that the USGS map doesn't show earthquakes under magnitude 4 outside the U.S.
Labels: Bill McGuire, earthquakes, Greenland, hydrates, isostatic rebound, methane, Rob Howarth, Thorne Lay, U.S.
Nick Breeze interview with East Siberian Arctic Shelf researcher (ESAS) Dr. Natalia Shakhova on why the important news about methane news is not reaching mainstream news. Powerful interests seem to be in the way of Arctic methane education. important research on methane and a dwindling Arctic. The presenters and attendees there included a list of over 200 important climate scientists from different parts of the world. One could assume from the list of workshops that this conference was being held to talk about and discuss the critical loss of ice we are seeing in the Arctic, and that the purpose of the meeting would be to include any and all data relevant to this never-before-seen-in-human-history event. People following the rapid loss of Arctic ice and all that data could even be forgiven for feelings of excitement and hope that at least someone is ‘working on it’. We could have assumed that communication was one of the goals here, especially since the conference was tweeted widely, even from inside the conference. Following those tweets we could also have assumed that it was intended that people in the conference were to share information that was important not only about climate change but the loss of the Arctic sea ice. Such a conference sounds like a great idea, doesn't it? We could have a cause for hope and the organizers seemed transparent, even going so far as to tweet plans. But such assumptions and presumptions would have been misplaced. Instead, what happened has turned into what has been called a Royal Society snubbing of scientists: a brouhaha has developed both in scientific circles and the world wide web, and has now raised serious questions. 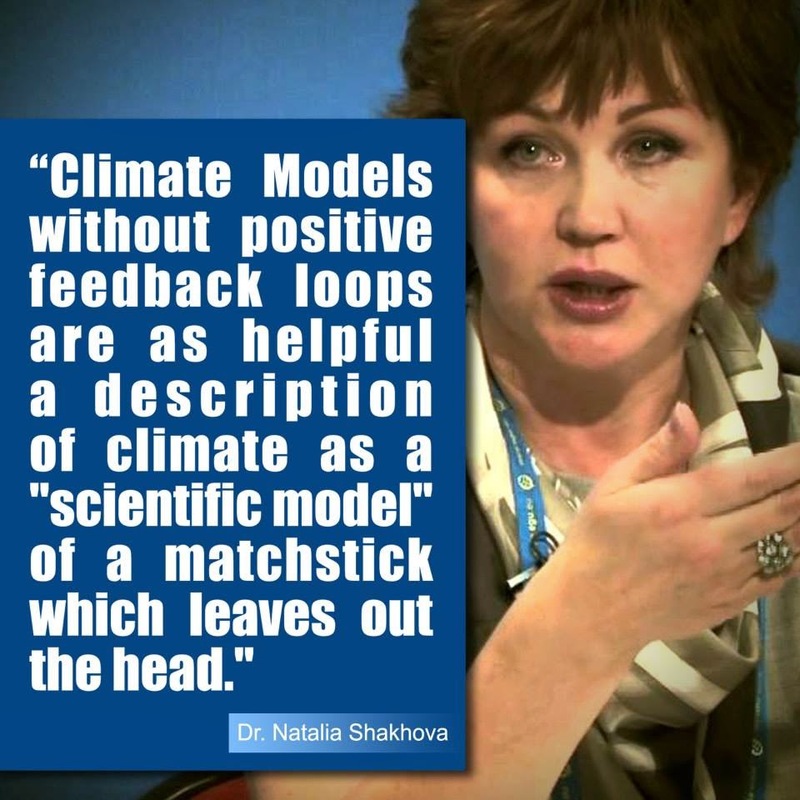 The main issue was that cutting edge scientists Dr Shakhova and Dr Semiletov were not even invited to present or discuss their very recent findings on important Arctic sea ice and methane releases. Who are they and what did they have to offer to this conference? Perhaps it was an ‘accident’ that they were not invited? Maybe they were just not on the guest list? Or, if they were deliberately not invited, what could be the reason? As it turns out Dr Shakhova & Dr Semiletov had just returned from a crucial expedition to the Arctic. The Swerus C3 expedition was conveyed aboard the icebreaker Oden. The goal was to gather data about the Arctic, in particular concerning methane hydrates and systems interaction. This could all be read as some mere diplomatic or career-based tussle among scientists, or some type of television drama happening at an obscure conference of less-than household names, so why would the average reader be interested in what this has to do with life on earth? A recent article in USA Today entitled Study: Earth in the midst of sixth mass extinction states: “The loss and decline of animals around the world — caused by habitat loss and global climate disruption — mean we're in the midst of a ‘sixth mass extinction’ of life on Earth, according to several studies out Thursday in the journal Science. One study found that although the human population has doubled in the past 35 years, the number of invertebrate animals – such as beetles, butterflies, spiders and worms – has decreased by 45% during that same period.” Simple Google searches on this topic allow one to uncover a recent addition of many such articles on the same topic. To be clear, I have the utmost respect for the scientific community and what they have contributed to the advancement of science. I have interviewed some, and helped give voice to the work of scientists, professors, teachers. and experts: I believe in open communication. I believe that when there is a huge problem as in this case of our planetary emergency or ‘6th mass extinction event’, we need all hands on deck, especially the ones out there on the front lines. Dr Shakhova & Dr Semiletov are two of these. According to computer modelling, our ‘Arctic air conditioner’ was supposed to stay intact and run effectively for many years. Previously the year 2100 was said to have been the year we would really see all ‘he##’ break loose. Now we realize that those models were way off. In fact, our ‘air-conditioner’ is self-destructing more every minute, causing a meandering jet stream which is already reeking climate havoc around the world: typhoons, hurricanes, tornadoes, and other such catastrophic climate events are more commonplace. Indeed, climate change has already become downright nasty. What we were told would not happen until much later is actually taking place right now. Scientists and governments realize we have a great big problem and have started doing lots and lots of research into our ‘Arctic air conditioner’. Experts were sent to view the problem, Dr Shakhova & Dr Semiletov on board, and told to report back their findings. The air conditioning experts that were sent to check on the problem were not invited to address the Royal Society event to report back, nor to even discuss the air conditioner break down. To be fair, some of them were called upon, including Professor Peter Wadhams (although other significant issues arose to do with Prof Wadhams too). However, the only reporting scientists who were called upon to report on the problem were those same who have been using those same types of conservative computer modeling methods that have traditionally proved to be seriously behind the time actual timeline followed by the Arctic ice. Clearly it is has been safe to say for years now that those computer modeling methods are more conservative than accurate, and are now in fact far and away off the mark of accuracy. Even a non-scientist can clearly see there is a deeply serious divide between the predictions of conservative models and the dramatic melting events of current days. The Royal Society plans a ‘communicative’ conference on Arctic sea-ice and leaves out experts recently returned from a life-threatening expedition specifically to review the problem. Meanwhile, others in comfortable office chairs merely crunch data for help guessing at possible problem scenarios. To whom would you listen? Would you trust just one expert or would you call on as many experts as possible to pool resources? Do you feel safe just listening to one side of the story without real-world observations, data, and discussion being included? 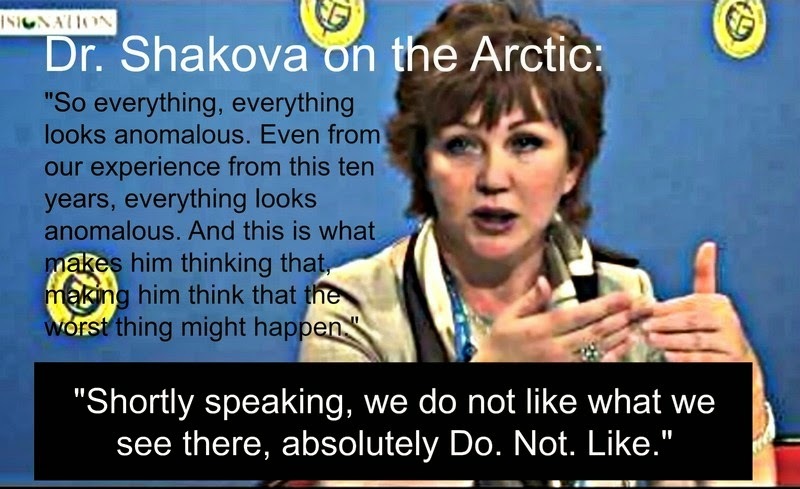 Imagine for a minute that you are Shakhova and her colleagues. You have been sent to view and report back on the broken air conditioner. You have observed rapid and almost unbelievable changes taking place on your expeditions. It is falling apart and leaking methane. You know that methane is many times more potent and powerful than carbon dioxide and can cause way more damage to the earth if lots of it are coming out. In fact, you have not seen such massive changes before on numerous previous expeditions. You are deeply concerned and really need to let others involved with the ‘Arctic air conditioner’ know what you have seen. But, when a chance to talk about your data and observations comes up, you are not invited. The very important meeting goes on without you and nothing that you have seen, documented, and observed will become public knowledge. You are stunned by this snub. You want to be able to tell them and therefore the world what is going on. You want to get this information out so that they will let others know what is happening to our ‘Arctic air conditioner’ and the symptoms that its melt are causing. We are pleased that the Royal Society recognizes the value of Arctic science and hosted an important scientific meeting last week, organised by Dr D. Feltham, Dr S. Bacon, Dr M. Brandon, and Professor Emeritus J. Hunt (https://royalsociety.org/events/2014/arctic-sea-ice/). Our colleagues and we have been studying the East Siberian Arctic Shelf (ESAS) for more than 20 years and have detailed observational knowledge of changes occurring in this region, as documented by publications in leading journals such as Science, Nature, and Nature Geosciences. During these years, we performed more than 20 all-seasonal expeditions that allowed us to accumulate a large and comprehensive data set consisting of hydrological, biogeochemical, and geophysical data and providing a quality of coverage that is hard to achieve, even in more accessible areas of the World Ocean. To date, we are the only scientists to have long-term observational data on methane in the ESAS. Despite peculiarities in regulation that limit access of foreign scientists to the Russian Exclusive Economic Zone, where the ESAS is located, over the years we have welcomed scientists from Sweden, the USA, The Netherlands, the UK, and other countries to work alongside us. A large international expedition performed in 2008 (ISSS-2008) was recognized as the best biogeochemical study of the IPY (2007-2008). The knowledge and experience we accumulated throughout these years of work laid the basis for an extensive Russian-Swedish expedition onboard I/B ODEN (SWERUS-3) that allowed more than 80 scientists from all over the world to collect more data from this unique area. The expedition was successfully concluded just a few days ago. In addition, we would like to highlight the Anglo-American bias in the speaker list. It is worrisome that Russian scientific knowledge was missing, and therefore marginalized, despite a long history of outstanding Russian contributions to Arctic science. Being Russian scientists, we believe that prejudice against Russian science is currently growing due to political disagreements with the actions of the Russian government. This restricts our access to international scientific journals, which have become exceptionally demanding when it comes to publication of our work compared to the work of others on similar topics. We realize that the results of our work may interfere with the crucial interests of some powerful agencies and institutions; however, we believe that it was not the intent of the Royal Society to allow political considerations to override scientific integrity. We understand that there can be scientific debate on this crucial topic as it relates to climate. However, it is biased to present only one side of the debate, the side based on theoretical assumptions and modelling. In our opinion, it was unfair to prevent us from presenting our more-than-decadal data, given that more than 200 scientists were invited to participate in debates. Furthermore, we are concerned that the Royal Society proceedings from this scientific meeting will be unbalanced to an unacceptable degree (which is what has happened on social media). Consequently, we formally request the equal opportunity to present our data before you and other participants of this Royal Society meeting on the Arctic and that you as organizers refrain from producing any official proceedings before we are allowed to speak. In the meantime, we wait with anticipation to see what the U.K. Royal Society's response will be, and if we will be able to hear of Shakhova and Semiletov's latest data and observations on the state of the Arctic. I, for one, would like to know everything about how the ‘Arctic air conditioner’ is really doing; wouldn't you? Many thanks to Julian Warmington, Associate Professor at BUFS, Busan University of Foreign Studies, for editing this news report. 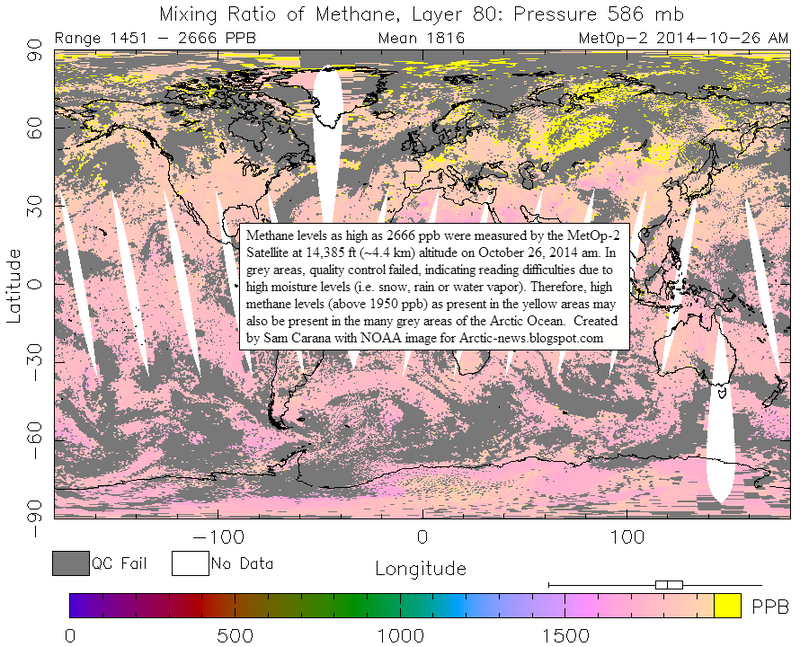 Methane levels as high as 2562 ppb were recorded on October 9, 2014, as illustrated by the image below. Many grey areas show up in the image where QC (quality control) failed, as it was too hard to read methane levels in the respective area, apparently due to high moisture levels (i.e. snow, rain or water vapor) in the atmosphere. As above image illustrates, cloud cover is high over the Arctic, while there is also precipatation in the form of snowfall. In other words, high levels of methane (above 1950 ppb, colored yellow) could be present over a much larger part of the Arctic Ocean, while methane in these grey areas could be even higher than the measured peak level of 2456 ppb. 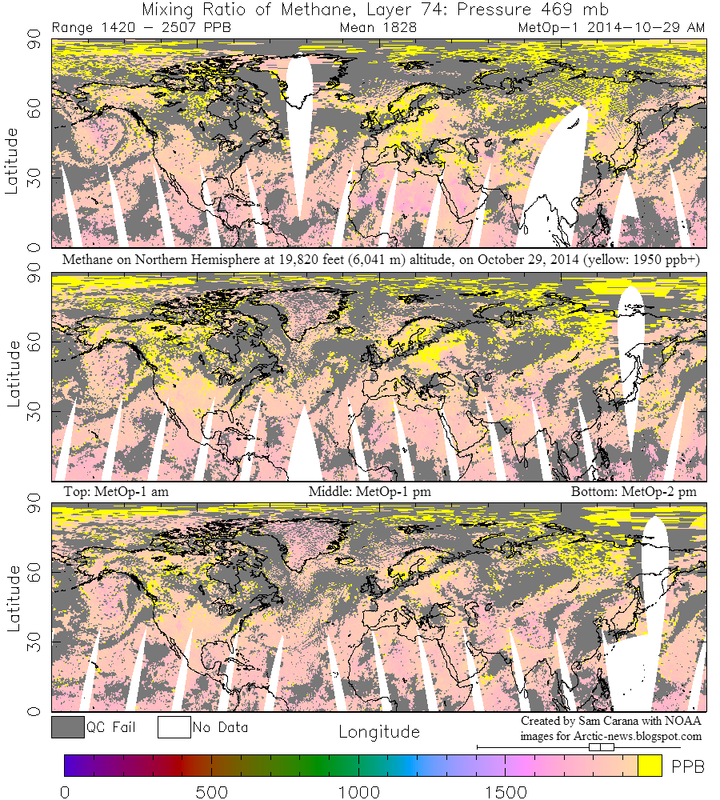 This appears to be confirmed by persistent high methane levels over vast areas across the Arctic Ocean both in the morning (top part of the image further above) and in the afternoon (bottom part of image) on 9 October 2014. The Gulf Stream keeps pushing warm water into the Arctic Ocean. The resulting eruptions of methane from the seafloor of the Arctic Ocean constitute a feedback that accelerates warming in the Arctic. As the Arctic warms up more rapidly than the rest of Earth, the Arctic's ice and snow cover will decline, further accelerating warming in the Arctic. As the Arctic warms up more rapidly than the rest of Earth, the speed at which jet streams circumnavigates the Northern Hemisphere will weaken, making it meander more, resulting in a greater frequency and intensity of extreme weather events, such as heat waves, droughts and wildfires. Here's an example of intense warming. Look at what is currently happening on Greenland. As the image above right shows, sea surface temperature anomalies as high as +1.89°C hit the North Atlantic (on October 8, 2014). Furthermore, high cloud cover over the Arctic (image further above) makes it hard for the heat there to radiate out into space, further contributing to high temperature anomalies. 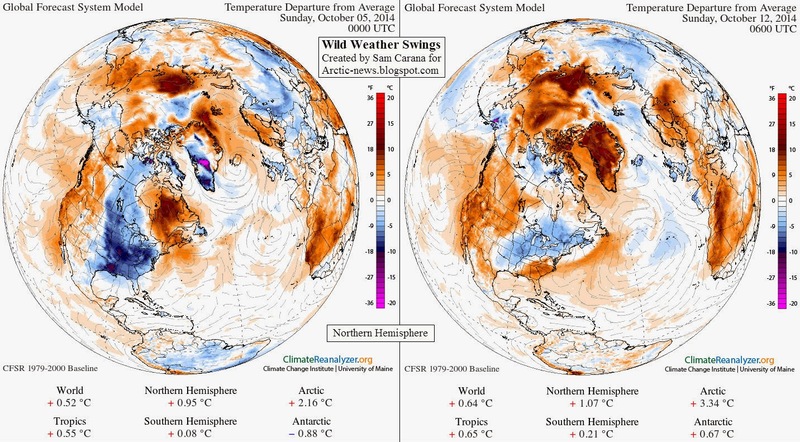 The image on the right shows high temperature anomalies over Greenland and parts of the Arctic Ocean on October 11, 2014. Note that anomalies are averaged out over the course of the day (and night). The image below (right) shows anomalies at the top end of the scale hitting large parts of Greenland at a specific time during this day. The left part of the image below shows how this could happen, i.e. jet streams curling around Greenland trapping warm air inflow from the North Atlantic. As said, as the Arctic warms up more rapidly than the rest of Earth, the speed at which jet streams circumnavigate the Northern Hemisphere will weaken, making the jets meander more and creating patterns that can trap heat (or cold) for a number of days over a given area. Due to the height of its mountains, Greenland is particularly prone to be increasingly hit by heatwaves resulting from such blocking patterns. Warming changes the texture of snow and ice, making it more slushy and darker, which also makes that it absorbs more of the sunlight's heat, further accelerating melting. As Paul Beckwith warns in an earlier post, melt rates on Greenland have doubled in the last 4 to 5 years, and melt rates on the Antarctica Peninsula have increased even faster. Based on the last several decades, melt rates have had a doubling period of around 7 years or so. If this trend continues, we can expect a sea level rise approaching 7 meters by 2070. These are all indications that the pace of climate change is accelerating in many ways, the most dangerous one being ever larger methane eruptions from the Arctic Ocean's seafloor. 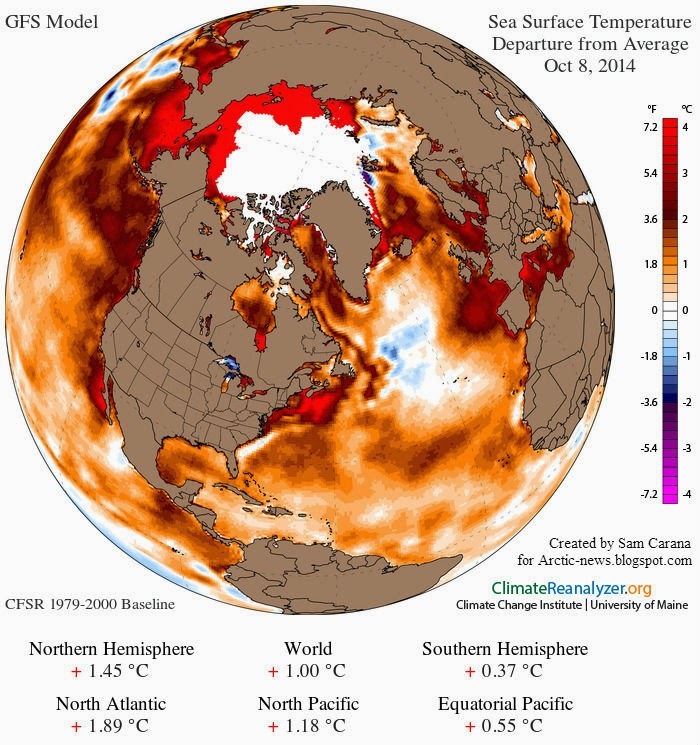 As the image below shows, sea surface temperature anomalies are very high in the Arctic Ocean, indicating very high temperatures under the surface. The situation is dire and calls for comprehensive and effective action, as discussed at the Climate Plan blog. Above combination-image illustrates some of the wild temperature swings that are taking place on the Northern Hemisphere. While the average temperature anomaly on the Northern Hemisphere may not differ much between the two dates (+0.95°C versus +1.07°C), huge temperature swings can occur locally, as is the case in Greenland. Note that the overall temperature anomaly for the Arctic is +2.16°C and +3.34°C, respectively, but it can be much more locally. What contributes to these high temperatures in the Arctic is that heat from the Arctic Ocean is entering the atmosphere where there still is open water, while large emissions of methane from the seafloor of the Arctic Ocean are exercizing their high immediate local warming potential. On the Southern Hemisphere, things aren't much different, as illustrated by the combination-image below. 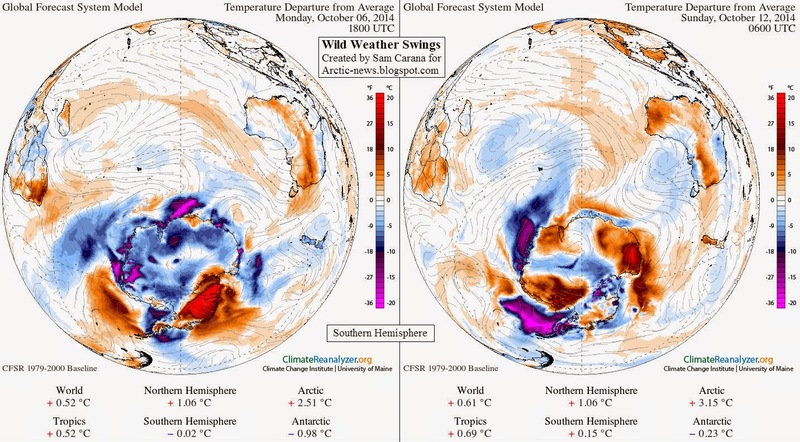 The two images show that, while the average anomaly for the Southern Hemisphere and for the Antarctic may not differ much between the two dates, temperature anomalies locally may go from one end of the scale to the other. And it's not merely temperatures that seem to have gone wild. Winds have strengthened, which can push sea ice far out into the sea surrounding Antarctica, while the resulting open water quickly freezes over. The result is expanding sea ice that traps heat in the ocean, as discussed in an earlier post. It appears that much of the extra energy trapped by greenhouse gasses becomes manifest as kinetic energy, in the form of stronger winds, storms and ocean currents. In conclusion, these huge temperature swings combine with pressure swings and storms, and with swings between expansion and contraction of soil and ice, resulting in severe shocks to ecosystems and infrastructure. The threat is that infrastructure will increasingly come under stress. Infrastructure that was built up over hundreds, if not thousands of years, is not easily replaced with more durable alternatives. Parts of infrastructure such as roads, buildings, railways, storm water and drainage systems, water supply, dams, levees and power poles may collapse without much scope for repair. Furthermore, soil degradation will increase, as in some areas storms grow stronger and run-off causes more erosion, while other areas may be hit by more severe droughts and dust-storms. In both cases, ecosystems will suffer and can go into shock, bringing food supply and habitat progressively and possibly abruptly under threat. As more and deeper cracks and fractures appear in sediments and soils, more methane may start entering the atmosphere. Indications that the integrity of the permafrost is breaking up under the stress of such swings were discussed in earlier posts such as this one and this one. The extra methane can constitute a powerful additional feedback loop, causing strong additional warming locally. - What's wrong with the weather? - Is Global Warming breaking up the Integrity of the Permafrost? The combined average temperature across global land and ocean surfaces for August 2014 was record high for the month, at 0.75°C (1.35°F) above the 20th century average of 15.6°C (60.1°F). June–August 2014, at 0.71°C (1.28°F) higher than the 20th century average, was the warmest such period across global land and ocean surfaces since record keeping began in 1880. The August global sea surface temperature (SST) was 0.65°C (1.17°F) above the 20th century average of 16.4°C (61.4°F). This record high departure from average not only beats the previous August record set in 2005 by 0.08°C (0.14°F), but also beats the previous all-time record set just two months ago in June 2014 by 0.03°C (0.05°F). The June–August global ocean surface temperature was 0.63°C (1.13°F) above the 20th century average, the highest on record for June–August. This beats the previous record set in 2009 by 0.04°C (0.07°F). This was the warmest August on record, primarily due to very high Sea Surface Temperatures in the Northern Hemisphere. 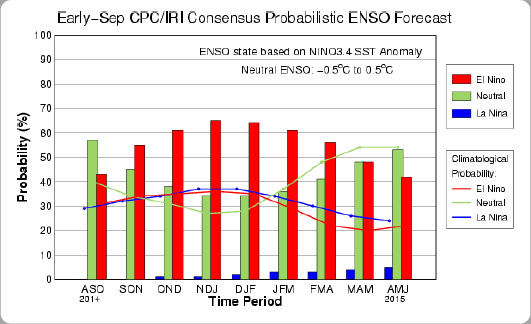 There is no El Nino event in this period, but some sort of event - hopefully an event not a climate shift - is taking place. If this is an event, the situation will become more normal when it ends, which will be in less than a years time at worst. If it is a climate shift, we are in desperate trouble, though I think it is an event. It is worth noting that these very high Sea Surface Temperatures are likely to lead to high land temperatures soon, as normally land temperatures in the Northern hemisphere can be expected to exceed Sea Surface Temperatures. The drought affecting California and the whole of the west of North America, Central America, and large parts of the Brazilian rainforest, though preceding this event was almost certainly down to changes which started before this event but ultimately caused it. Despite the record high combined average temperature across global land and ocean surfaces for August, the global economy will continue as normal and no specific action can be expected to be taken to curb emissions. This will change, if global temperatures continue to rise. Temperatures are high enough to cause global concern, however. More later. Note: NOAA's most recent (Sep 4, 2014) prediction puts the chance of El Niño at 60-65% during the Northern Hemisphere fall and winter. Sea surface temperatures (SST) can be expected to remain high in the Arctic Ocean, as SST anomalies are high in the North Atlantic (+1.65°C, image left) and high temperatures are forecast over the Arctic for at least the next seven days (anomalies as high as +2.87°C, image right). For a comparison with October 3 temperatures, see this earlier post. Additionally, an increasing amount of heat has been going into the deeper parts of the ocean, and the Gulf Stream will for month to come continue to transport water into the Arctic Ocean, and this water will be warmer than the water already there, threatening to unleash ever larger eruptions of methane from the seafloor of the Arctic Ocean, as discussed in this earlier post. In conclusion, the situation is dire and calls for comprehensive and effective action, as discussed at the Climate Plan blog. - NOAA National Climatic Data Center, State of the Climate: Global Analysis for August 2014. The presence of GHGs (greenhouse gases) in the atmosphere is vital to sustain life on our planet. These GHGs trap heat and keep the global average surface temperature of the planet at about 15°C, versus a chilly -18°C, which would be our temperature without the GHGs. We have changed the chemistry of the atmosphere, specifically of the concentrations of the GHGs. Concentrations of carbon dioxide have increased about 40% since the start of the industrial revolution (from a tight range between 180 to 280 ppm over at least the last million years) to 400 ppm. Concentrations of methane have increased by more than 2.5x since the start of the industrial revolution (from a tight range of 350 to 700 ppb) to over 1800 ppb. The additional heat trapped has warmed our planet by over 0.8°C over the last century, with most of that rise (0.6°C) occurring in the last 3 or 4 decades. Over 90% of the heat trapped on the surface of the planet is increasing the temperature of the ocean water. The increased levels of carbon dioxide in the atmosphere acidify the rainfall, and have increased the acidity of the oceans by about 40% in the last 3 to 4 decades (pH of the open ocean has dropped from 8.2 down to 8.05 on the logarithmic scale). An increased drop to a pH of 7.8 will prevent calcium based shells from forming, and threaten the entire food chain of the ocean. Changes in ocean currents, and vertical temperature profiles are leading to more stratification and less overturning which is required to transport nutrients to the surface for phytoplankton to thrive. Global sea levels are presently rising at a rate of 3.4 mm per year, compared to a rate of about 2 mm per year a few decades ago. Melt rates on Greenland have doubled in the last 4 to 5 years, and melt rates on the Antarctica Peninsula have increased even faster. Based on the last several decades, melt rates have had a doubling period of around 7 years or so. 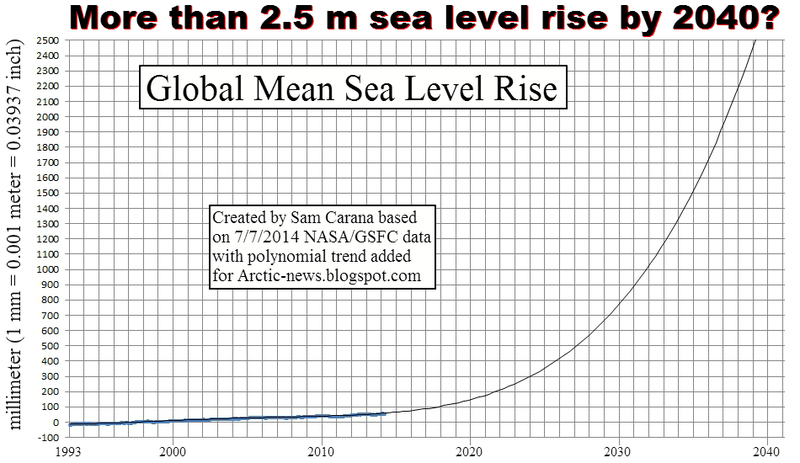 If this trend continues, we can expect a sea level rise approaching 7 meters by 2070. Higher global average temperatures have increased the amount of water vapor in the atmosphere by about 4% over the last several decades, and around 6% since the start of the industrial revolution. Changes in heat distribution with latitude from uneven heating with latitude has slowed the jet streams and caused them to become wavier and fractured, and has changed the statistics of weather. We now have higher frequencies, intensities, and longer duration extreme weather events and also a change in location of where these events occur. The sensitivity of the climate system to increased levels of GHG appears to be much higher than previously expected due to many powerful reinforcing feedbacks. Arctic temperature amplification from exponentially declining sea ice and spring snow cover are the strongest feedbacks in our climate system today. The average albedo (reflectivity) of the Arctic region has decreased from 52% to a present day value of 48% over 3 or 4 decades. The increased absorption of energy in the Arctic has increased the temperature at high latitudes at rates up to 6 to 8x the global average temperature change. The reduced temperature difference between the Arctic and equator has reduced the west to east speed of the jet streams causing them to slow and become wavier and more fractured, and directly causing a large change in the statistics of our global weather. Methane gas emissions have been rapidly rising in the Arctic region from the terrestrial permafrost and the continental shelf marine sediments, most notably on the ESAS (Eastern Siberia Arctic Shelf). 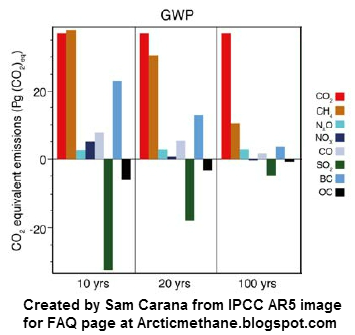 The extremely potent ability of methane to warm the planet (global warming potential GWP is >150, 86, and 34 times for methane relative to carbon dioxide on a few year, several decade, and century timescale, respectively) makes increased emissions an extremely dangerous risk to our well-being on the planet. Our climate system is presently undergoing preliminary stages of abrupt climate change. If allowed to continue, the planet climate system is quite capable of undergoing an average global temperature increase of 5°C to 6°C over a decade or two. Precedence for changes at such a large rate can be found at numerous times in the paleo-records. From my chair, I conclude that it is vital that we slash greenhouse gas emissions and undergo a crash program of climate engineering to cool the Arctic region and keep the methane in place in the permafrost and ocean sediments. Paul Beckwith is part-time professor with the laboratory for paleoclimatology and climatology, department of geography, University of Ottawa. Paul teaches climatology/meteorology and does PhD research on 'Abrupt climate change in the past and present'. Paul holds an M.Sc. in laser physics and a B.Eng. in engineering physics and reached the rank of chess master in a previous life. Click here to view Paul's earlier posts at the Arctic-news blog.